CLARIFY YOUR PURPOSE. RADIATE YOUR GIFTS. LIGHT UP THE WORLD. The Elevated Mastermind starts April 19th! So you’re madly in love with your spiritual practice and you’re feeling more energized and inspired than ever. But you’re probably wondering one thing: what the hell do I do with all of these amazing vibes? If you’re like many members of the Elevate the Globe fam, you might feel called to spend your days differently. Maybe you’ve realized that your current career isn’t aligned with your new way of being, but you have no clue what to do instead. Or maybe you KNOW you’re meant to be a light worker, but you’re not sure how to become more visible and get paid well for your passion. Either way, we’ve got you! 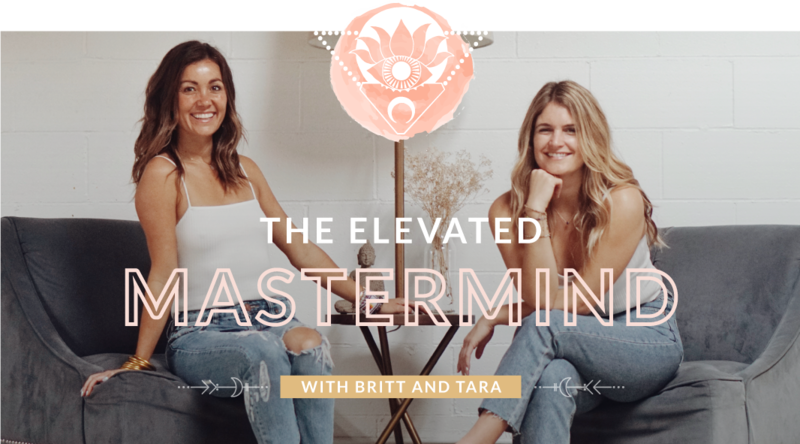 We developed The Elevated Mastermind—an elite, high-vibe business mentorship program—to help you build on your spiritual foundation and manifest your next moves with confidence. Basically, it’s a group of like-minded boss babes (and boss dudes!) who meet up on the reg to motivate each other, support each other, and learn from each other. Not only will this program give you access to one-on-one coaching from us, Britt + Tara—a super rare opportunity!—but you’ll also walk away with a lifetime network of badass friends who are working alongside you to change the world. We know how valuable this kind of experience is because we’ve lived it. We could never have left our corporate jobs and created Elevate the Globe without each other, or our bigger tribe of entrepreneurial BFFs in LA and beyond. We’re all so much stronger when we chase our dreams together! Over the course of three months, you’ll receive encouragement, support, and teachings that’ll help you get clear on your calling and set you up for next-level prosperity. We’ll help you pinpoint the unique gifts that have always been within you. We’ll clear the subconscious fears that keep you stuck and playing small. And because of all this, you’ll be on track to call serious abundance into your life, just for being you and doing what you love. You won’t recognize yourself 12 weeks from now! We don’t have to tell you how scary it is to step out of your comfort zone and build a new life, especially if the people around you don’t understand your vision. The Elevated Mastermind gives you the courage and tools to make those big shifts, with a loving tribe behind you every step of the way. Your mission in this lifetime is so much greater than you can even imagine. We won’t offer The Elevated Mastermind again in 2019, so it’s time to get started and help us elevate the globe! If so, you're ready for the Elevated Mastermind! Our BONUS for YOU is a FULL 62-minute Jupiter Meditation for Business and Opportunities video that we will all do once a week- more on why later! We decided to add a second BONUS this round and we will be bringing on some of our favorite boss humans as guest teachers to drop some wisdom in additional trainings. What to expect from the Elevated Mastermind? The Elevated Mastermind consists of 6 modules, with a new module opening every two weeks. Each module includes a spiritual business training video, journal prompts, and a live group Zoom call where you’ll get one-on-one coaching from Britt + Tara in a roundtable setting. We kick off the mastermind by diving into our first 40-day morning sadhana practice and the Jupiter Meditation for Business and Opportunities—the foundation for everything else to come. This powerful Kundalini yoga combo strengthens our auras so we can attract new opportunities; cleanses our subconscious of trauma, fear, and negative thought patterns; and trains us to operate out of a positive mind. Commit to these practices for the next 12 weeks, and you’ll be a magnet for your wildest dreams! Everyone comes to Earth with a life purpose. But how do you even begin to figure out what yours is? (Hint: It’s probably not how you think!) This week, we’re helping you get crystal clear on your mission. Whether you’re starting from zero, have a spiritual business already, or are multipassionate and can’t decide what to pursue, we’ll break down the blocks that are keeping you stuck in the fog. Prepare for some major downloads! Good things come to those who hustle, right? Not exactly. This week, we’re sharing how to take aligned action towards your goals—which puts you in a place of ease and flow— instead of pushing from a place of fear, lack, or insecurity. You’ll learn the game-changing technique we use to manage our time and move our business forward without getting overwhelmed. We’ll also start a new 40-day morning sadhana that helps us open our hearts and express our divine essence. Pro athletes work with visualization and mindset coaches for one reason: They know everything starts in the mind. This week, we’re spilling the visualization and goal-setting techniques we used (and still use!) to grow Elevate the Globe into the wildly successful business it is today. We’re also giving you an inside look at exactly how we started ETG from nothing (and how we dealt with failures along the way). You’ll also learn why you don’t need to have a business up and running to start pulling in money right now. Yes, really. Picture the most radiant, powerful, confident version of you—and get ready to become that person IRL. As we go into month three, you’ll learn to trust in your talents and stand strong in who you are, so everything that’s for the highest good of your soul will be attracted to you. We’ll also start an 18-day challenge that will amp up your creativity, kick you out of your comfort zone, and expand you like crazy. It’s time to fall in love… with the sound of your own voice. For the final module, you’ll start paying close attention to the sound current you’re creating, learning how to speak from your heart and channel the light. We’ll give you our favorite mantras for strengthening your sound current, and share tips on how to use social media and blogging to connect, collaborate, and project your message to the world! * Weekly workshop and call schedules will be outlined in each module. Live Zoom call times will be determined based on everyone’s schedules. What our Elevated Mastermind alumni are saying? 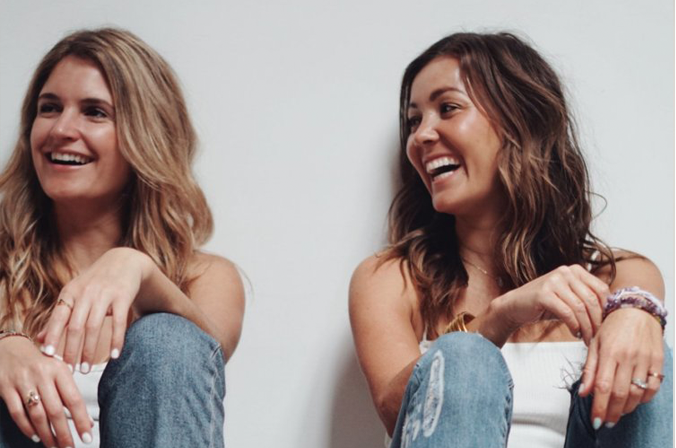 We’re Britt Deanda and Tara Schulenberg—co-founders of Elevate the Globe, certified Kundalini yoga and meditation instructors, and healers here to raise consciousness on the planet. We’re spiritual entrepreneurs and high-vibrational living experts who pair Kundalini yoga with spirituality, astrology, and sustainability, helping people align with their own truth and best way of living. We have grown our spiritual business to reach thousands of people and it is our mission to share the tools we teach to change millions of people’s lives. We both have corporate backgrounds in marketing, advertising, and consulting, as well as extensive training and certifications in Kundalini Yoga and Meditation and spiritual teachings. We have blended this wisdom together—with an assist from our deep intuitive connection with the divine—to create our wildly successful spiritual business and movement, Elevate the Globe. Our classes, events, retreats, courses, and membership community deliver incredibly transformative results. The transmission of energy we provide ignites people from all walks of life to uplevel and step into their power as happy, healthy, and abundant lightworkers elevating the globe. Since starting Elevate the Globe 2 ½ years ago, we’ve increased our revenue and positive impact on the world every day, doing what we love most. Last month we hit 50k instagram followers, and we get messages all the time about how our work helped someone change their life to be one of love and gratitude—sometimes even overcoming depression or thoughts of suicide. Nothing is more rewarding than that. Plus, we are able to support a lifestyle of time, financial, and location freedom—in February we had our highest revenue month at over $50,000—and we want more people to do the same.